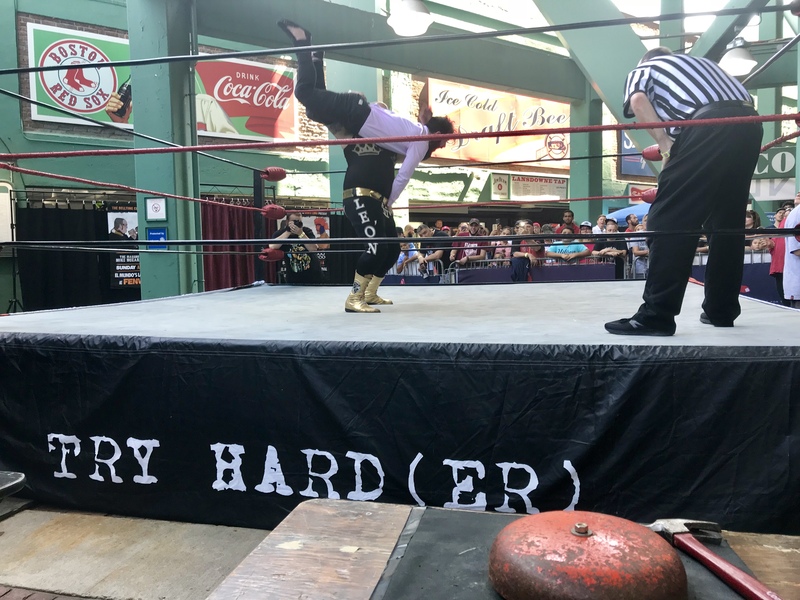 Home › Pro Wrestling › Calling Fenway, Again! 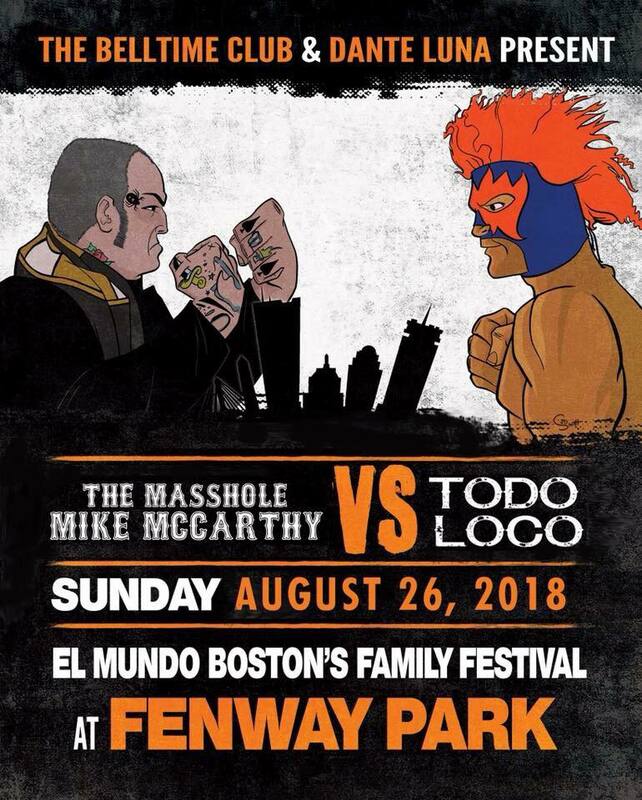 Once again, your boy was booked to work the wrestling show at Fenway Park as part of the El Mundo Latin Family Festival. The plan was to split ring announcing duties and do commentary on one match in particular since I knew all of the wrestlers involved. Well, I never got the chance to ring announce due to one slight problem. Someone forgot to book the timekeeper. You know, the guy that rings the bell. In fact, no one realized that the actual physical bell was missing until the referee signaled for it. No ding, ding, and the referee Redd Roche’s calm wave turned feverishly angry as a quiet panic ensued at ringside. Even the DJ looked for a bell file in his music catalog to simulate over the speakers. The wrestlers said the heck with all this and locked up to begin the match. Moments later, event promoter, Dante Luna found the bell, hustled through the audience and held it over the barricade for someone to grab. Slight problem, however. No one went to grab the bell. At that point, I knew what I had to do. I grabbed the bell, placed it on the table and banged it with a hammer to signal the commencement of combative theater…three minutes late. Appointing myself as timekeeper sealed the fate of Loren Petisce as the sole ring announcer for seventeen matches over four hours. That is a lot of work and I couldn’t get the message to her until the after the third match…The joys of independent wrestling folks! Overall, it was a fun show. The crowd really didn’t get into it until the second half. All of the wrestlers worked hard, it’s just one of those things that can happen when one act of a large festival full of events. 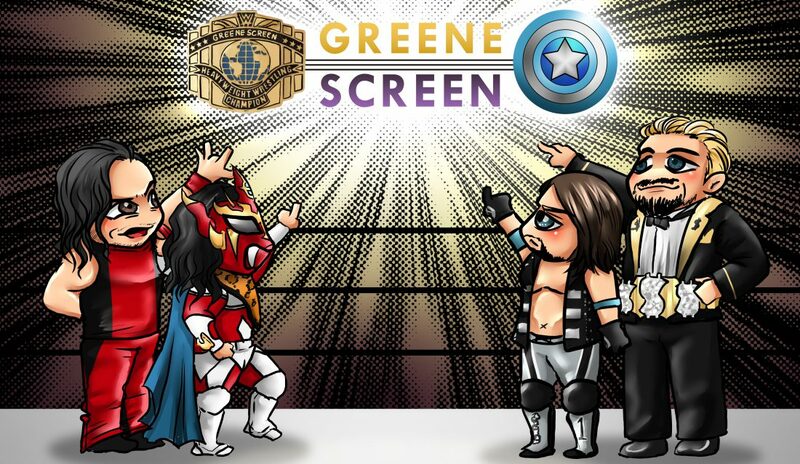 Green Monster Innovational Tournament: Sami Diaz defeated King Leon the 6th, Dan Terry, and CPA. Green Monster Innovational Tournament: “The Selfie Made Man” Vern Vicallo defeated Sully Banger, Connor Davies and Bobby Ocean. Green Monster Innovational Tournament: “Riot” Kellan Thomas defeated Garrett Holiday, “Slamdance” Tim Lenox and Showtime. Green Monster Innovational Tournament Finals: Channing Thomas defeated Vern Vicallo, “Riot” Kellan Thomas and Sami Diaz to win the tournament. Isana won a 30 person Battle Royal by eliminating Jake in the finals moments of the contest.